SEOUL: A tourist from the Republic of Korea (ROK) was shot dead on Friday by a soldier from the Democratic People's Republic of Korea (DPRK), a spokesman for the ROK's Unification Ministry said. The shooting of the 53-year-old woman at the Diamond Mountain resort was reported just hours after ROK President Lee Myung-bak delivered a nationwide address calling for restored contacts between the two sides, which have been on hold since he took office in February. The woman had been ordered to halt after entering a military area early on Friday at the resort and was running away when DPRK soldiers opened fire, ROK Unification Ministry spokesman Kim Ho-nyeon said, citing information given by Hyundai Asan, the ROK company that operates the resort. "We regret that our tourist was killed," Kim said, adding that Seoul "will take appropriate corresponding measures" pending the results of a probe. The victim was identified only by her surname, Park. Kim said she had left her room at 4:30 am and was shot at about 5 am. Her body was moved to a hospital in the ROK city of Sokcho. Park was shot twice from behind, hospital official Cho Yong-seok said. One bullet hit her in the chest, causing her death, and another shot struck her left hip, he said. The ROK will suspend future Diamond Mountain tours until it completes an investigation, Kim said. About 1,200 tourists currently at the resort will complete their tours as scheduled, with some leaving as late as Sunday, Hyundai Asan said. The resort is in a heavily militarized area near the tense border between the Koreas, the world's last Cold War frontier. On the road to the resort, mobile rocket launchers dot the hillsides. The DPRK informed Hyundai Asan about the shooting, but there has not yet been any communication from Pyongyang to Seoul officials about the death. The resort on the peninsula's eastern coast, which opened in 1998, is one of the most high-profile projects between the two Koreas. Hyundai Asan operates the resort as a tourist enclave inside the DPRK, complete with convenience stores and a duty-free shop selling luxury goods. The area is one of two DPRK tourist programs run by the company, which are the only sites that offer relatively free access to visitors to the DPRK. About 1.9 million visitors, mostly from the ROK, have visited Diamond Mountain, including some 190,000 people this year, according to the Unification Ministry. Relations have chilled since ROK President Lee took office with a tougher policy toward the north. However, on Friday, Lee proposed a resumption of dialogue between the Koreas and said he would respect earlier agreements from North-South summits, a softening of his earlier stance. 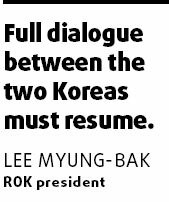 "Full dialogue between the two Koreas must resume," Lee told the opening session of parliament. "The South Korean government is willing to engage in serious consultations on how to implement" the summit deals and other previous agreements between the two sides, he said.